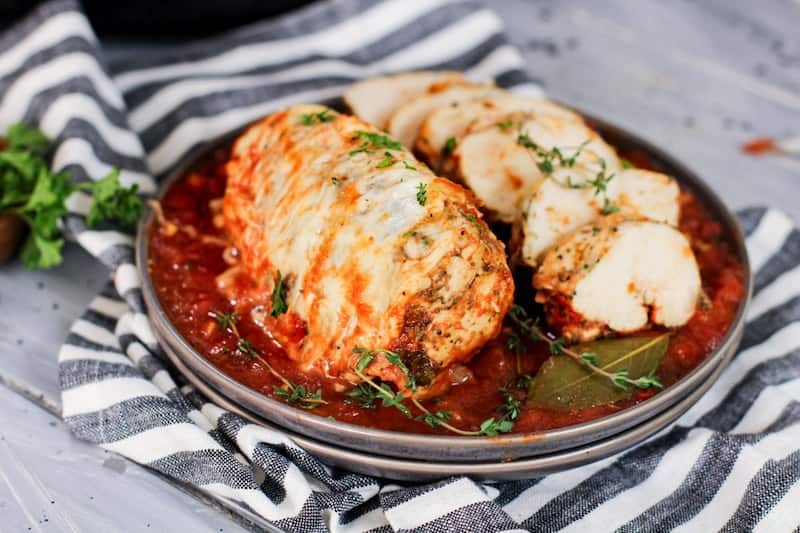 This Keto Chicken Parmesan Recipe is a recipe that you will want to add to your weekly menu planning. The whole family will enjoy it. In fact, you will have non-keto friends that will enjoy it too! It's one of those really good recipes you will be so glad you tried. Are you just curious about the Keto diet and maybe don't understand it completely or maybe you don't know where to start? Read this article: How to Start Keto the Easy Way! It breaks the keto diet down to an easy way to understand it but more importantly, an easy way to start. 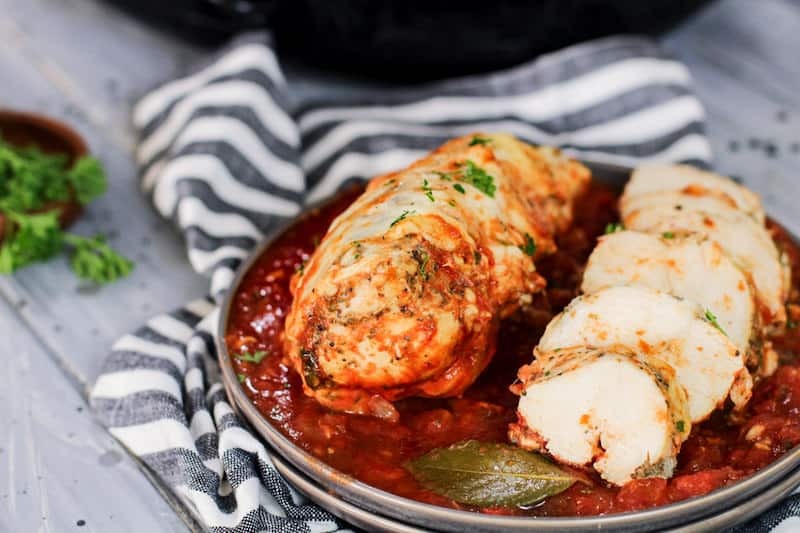 If you like this recipe, I just know you will love this Keto Cheese Stuffed Meatballs recipe too! 1. In a large bowl, season chicken with Italian seasonings, salt, and pepper. Set to the side. 2. 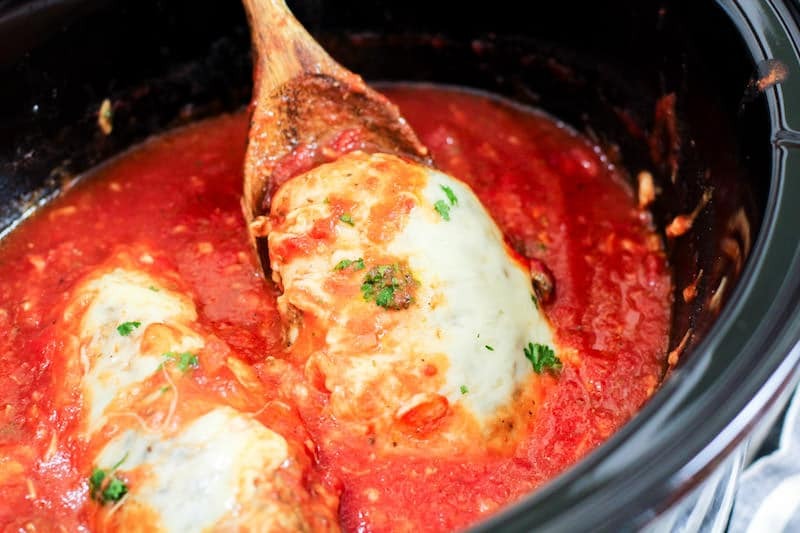 To the insert of a slow cooker, add in sauce ingredients and mix together. 3. Gently add in chicken breasts, cover, and cook on low for 4-5 hours or high for 3 hours. until cheese melts, about 10 to 15 minutes. 2. In a large bowl, season chicken with Italian seasonings, salt, and pepper. Set to the side. 3. Add teh sauce ingredients to a deep casserole dish and mix together. 4. Place the seasoned chicken in the deep casserole dish on top of the sauce. 5. Bake it for about 20 minutes at 350 degrees. 6. Top with cheese and bake it for another 5 minutes until the cheese has completely melted. 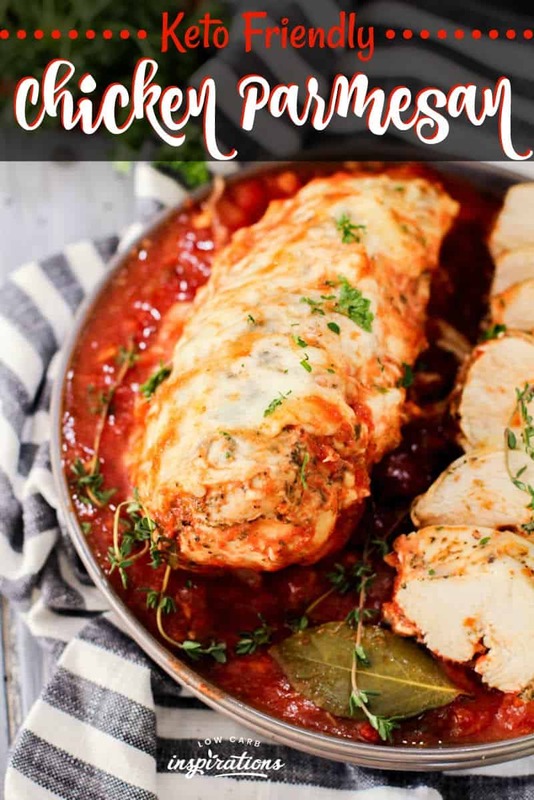 This recipe is totally keto friendly and low carb! So, yes, it’s healthy! 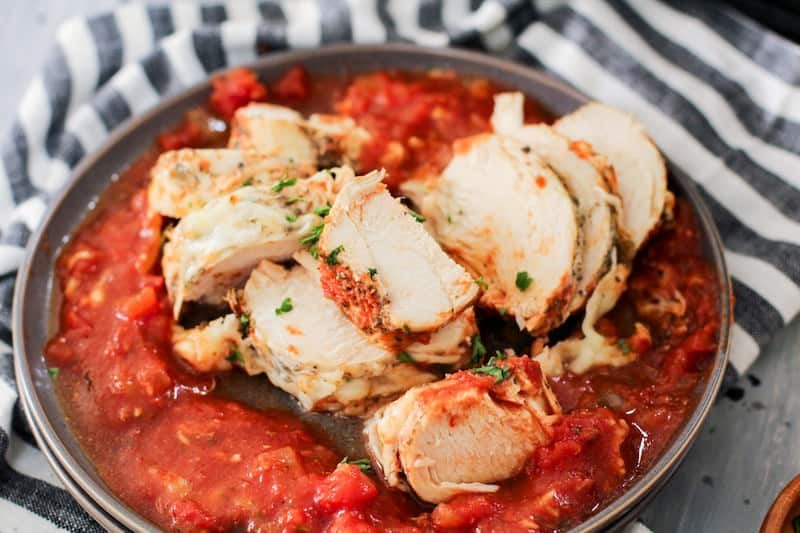 Is Chicken Parmesan Keto friendly? Yes, this version is definitely keto friendly. Some people do prefer to put a batter crust on their chicken when making a Chicken Parmesan recipe. This recipe is specifically made low carb and keto friendly so we choose to not add a carb filled batter. It doesn’t really need it. It tastes amazing just like this! 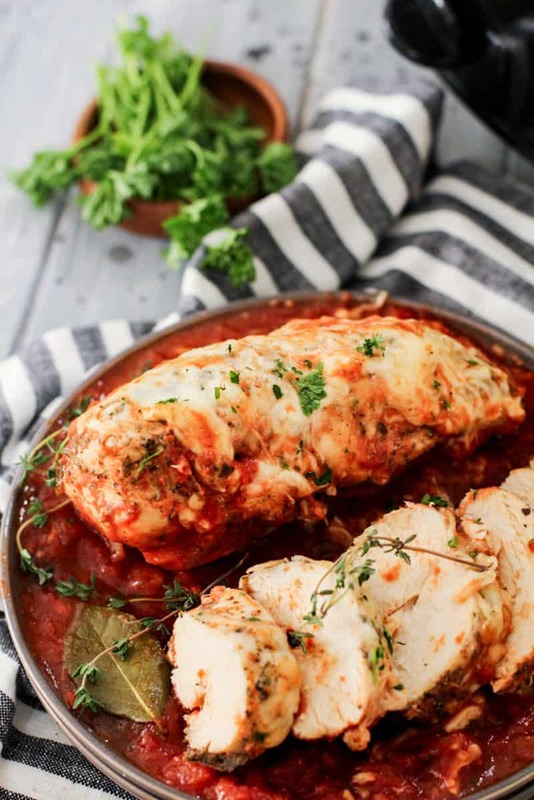 Can you make Chicken Parmesan ahead of time? Yes! But I would use fully cooked chicken. You can add all the ingredients to a freezer safe container and store it in the freezer for up to 3 months. 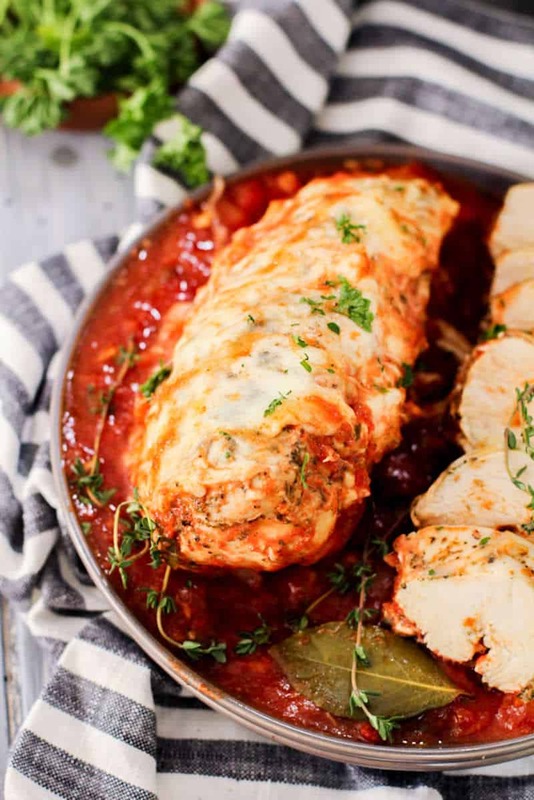 To cook it: Remove it from the freezer the night before to allow it to thaw overnight. Cover it with foil and cook as usual. If it is frozen in the center (not fully defrosted) then just cook it for about 10 minutes longer than you usually would. In a large bowl, season chicken with Italian seasonings, salt, and pepper. Set to the side. 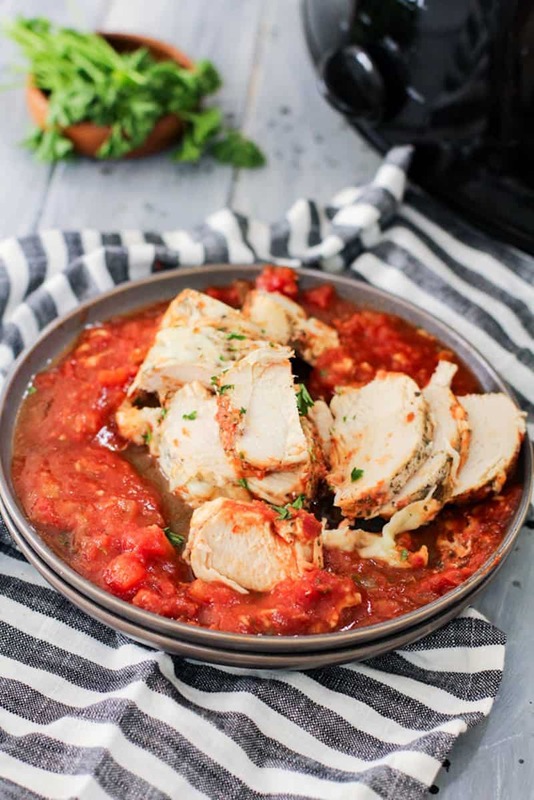 To the insert of a slow cooker, add in sauce ingredients and mix together. Gently add in chicken breasts, cover, and cook on low for 4-5 hours or high for 3 hours. Add the sauce ingredients to a deep casserole dish and mix together. Place the seasoned chicken in the deep casserole dish on top of the sauce. Bake it for about 20 minutes at 350 degrees. Top with cheese and bake it for another 5 minutes until the cheese has completely melted.